In an age of increasing fake news and data collection, the plot of Moral Panic could happen in the not too distant future. Amazon affiliate links are used on this site. A free audiobook was provided for an honest review. This short audiobook (it's just over 6 hours) is an excellent listen for fans of conspiracies and implications of social trends. Tanner Moore is kind of a fictional Steve Job or maybe a Jeff Bezos who is taking his company to the next level with drone delivery worldwide. However, he is in the way of another's political ambitions. A media leak from an of-the-record interview sees him toppling from the top and in the crosshairs of the FBI. In sweeps an underground organization calling itself Social Justice. Tanner is given the option - surrender to the FBI or use his technical skills to further the cause of the Social Justice. There's not really much of a choice. But Tanner does have the choice to work for or work against them. A whole lot of story is packed into this book. The pace is a quick one, and since I was listening to it on audio I would have liked a few pauses so I could process the plot. I recommend being fully focused on the audiobook in order to keep up. I was listening while at work and I know that I missed a few things. I thought it is ironic that Social Justice is going after human traffickers (a good thing!) by trapping, coercing, brainwashing (not a good thing!) highly skilled individuals in order to hack (and maybe manipulate) computer data in order to end the trafficking. I kept thinking do two wrongs make a right. And it makes you wonder if the organization is using the good activity to hide more nefarious activities. Apparently, Tanner thinks the same thing. I enjoyed the twist and turns in this cyber-thriller. I couldn't help but think back to when I watched The Circle (the 2017 movie with Tom Hanks and Emma Watson). Both Moral Panic and the movie had me thinking about how much good technology can do, but that even the good things about it can be used in evil ways or that there are areas where the good aspects can go too far and become a bad thing. 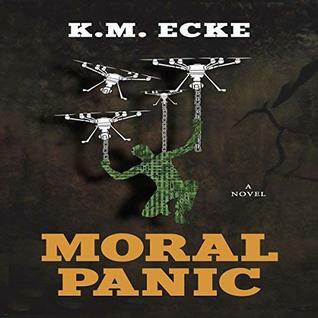 K. M. Ecke narrates the audiobook. I wasn't sure about it at first as I worried that the author wasn't objective in their ability to do narrate their own book - would it be like someone just reading the book out loud? I shouldn't have worried. Ecke is a terrific narrator. He gave each character their own unique voice so it was not a problem to distinguish which character was speaking. Whether you enjoy a good conspiracy, a thought-provoking social issues commentary, or just a hang on to the seat of your pants thriller, Moral Panic should be added to your to-read list. (or sign up for a free trial of Audible and choose it as one of your free listens).